"Fight!" is worth the price of this ebook. It is clever, practical and entertaining. 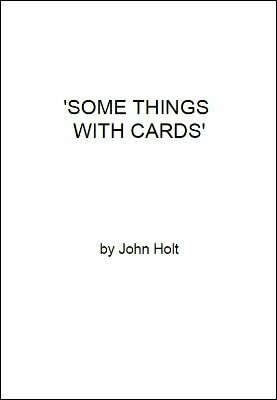 John Holt is a smart card handler. Slippy Sandwich – a two selection sandwich routine, as well as a transposition, that doesn’t use the standard loading move. Fourbearers – the four kings are placed to one side. Three selections are made and they appear between the kings….without the kings ever leaving the table. Includes a second, more gutsy version for the brave. Psychic mystery card……of death – a handling for the ‘Chicago Opener’ plot, with three revelations and some built in comedy. Fight! – how to reveal a selection twice: once as a mindreader, then as a magician. Also includes a two – selection handling. The World’s Greatest Card Vanish – a routine where a signed card vanishes from a between a specator’s hands…almost. One hand top palm idea – a technique to hide eliminates most of the common flaws associated with the one hand top palm. PDS transposition – a way of effecting a transposition between any two small borrowed objects; no duplicates required! 1st edition 2011; 17 pages.